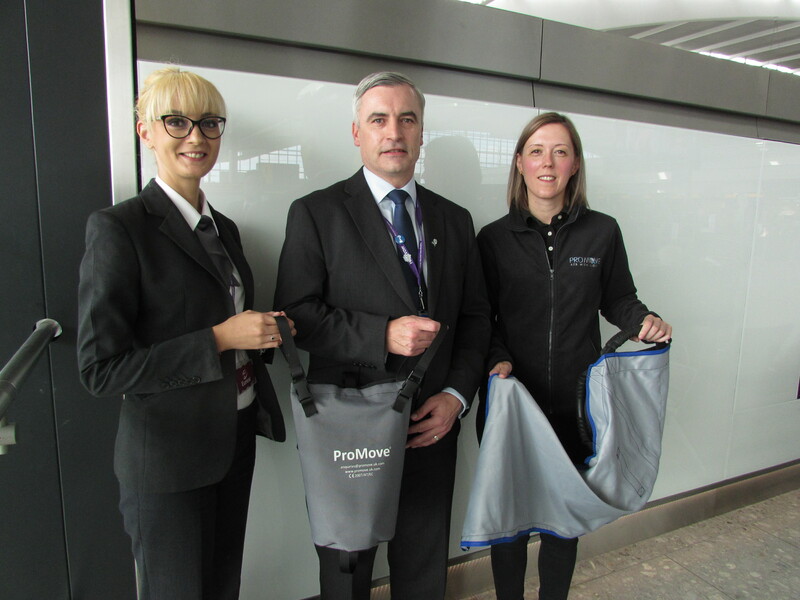 Heathrow Airport has recently seen the addition of around 100 ProMove Slings throughout the airport’s terminals, courtesy of OmniServ. The ProMove Sling allows staff to move passengers with reduced mobility with care and ease. Its design allows three or four members of staff to comfortably carry the passenger, without the need to touch them and with a reduced chance of causing injuries like bruising. Marc Buckle, General Manager at OmniServ, said: “The ProMove Sling is a brilliant solution to the challenges of helping PRM passengers in and out of wheelchairs in a restricted space. Andy Wright, managing director of Accessible Travel and Leisure, who was present at the launch, said: “I am delighted that Heathrow Airport has now considerably increased their stock of ProMove slings in support of passengers who, like myself, require additional support when transferring from their wheelchair to airlines seating.